If this were a concept design for the new Wolfman movie, we would be incredibly excited. 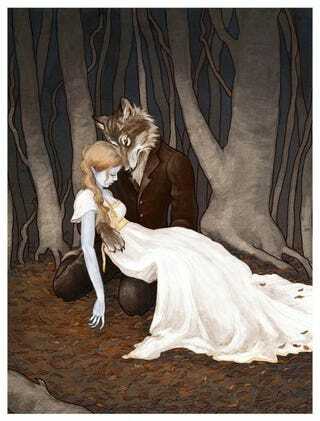 It looks like a warm-hearted Edward Gorey created this lush scene of the doomed love between wolf and woman. This is by the painter Bluefooted, who posts most of her work online. She likes to do characters from stories, and even did the cover art for a friend's fanfic. See if you can guess the character she's depicted below. You can see more of Bluefooted's work on Gorilla Art Fare.